We'll have another chilly morning but at least it will be less cold than Wednesday and the least freezing morning for most of us this week. The cold high-pressure system is now east of New England, and the return flow from the south should push most of our temperatures into the 50s Thursday afternoon. South facing shorelines have water temps at about 40 degrees and the temperature will hold in the low 40s elsewhere. Wind increases from the south Thursday, gusting past 25 mph during the afternoon. We may have gusts past 40 mph around the Champlain Valley of Vermont. Most of New England has a sunny day, but clouds will increase west and north Thursday afternoon. The next front is getting close Friday, with thickening clouds and a chance of a few showers. Temperatures Thursday night fall into the 30s, with a few 20s well north. Highs on Friday are close to 60 degrees. Again cooler by the shore. Weak low pressure along the front will push east of New England on Friday night. That will allow for the wind to come in from the north early Saturday. Our weekend will start off cool and gray, with a few showers, patchy fog and drizzle. But for most of southern and eastern New England, the sun should come out, with the temperature jumping back into the low 60s. 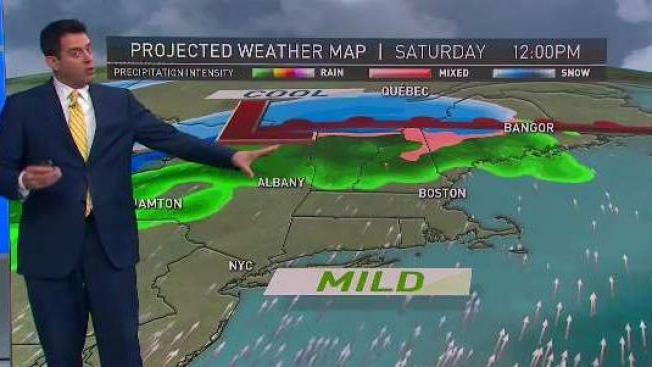 In parts of northern New England, it may stay cloudy with a temperature in the 40s, and showers. Little change Saturday night, a lot of clouds, patchy fog and drizzle, low temperature in the 40s. The forecast for Sunday is a little tricky with a front oriented from north to south across New England, pushing slowly to the east. West of the front will be cooling off with a chance of rain, or even mountain snow. On the east side of the front, we may have temperatures again in the 60s with a couple of hours of sunshine before some afternoon showers. Low pressure will form on the front to bring a period of rain or elevation snow to New England on Sunday evening, it may end as snow at lower elevations before moving out early Monday. A mixture of sun and clouds for April Fools' Day, with a high temperature close to 50 degrees. Along the south end of that front, there will be a significant storm forming off the southeast coast, and that may move north impacting New England by the middle of the week. It’s too early to make the call, so stay tuned to our First Alert 10-Day Forecast.